Beer Apostle: Westvleteren XII US Release: Gone before it was ever Released? 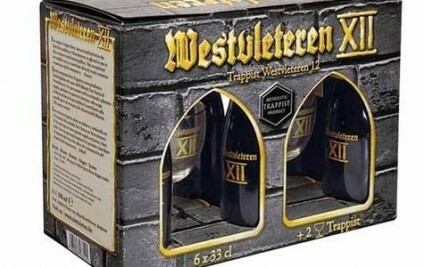 Westvleteren XII US Release: Gone before it was ever Released? Westvleteren XII is regarded by many as being the best beer on this planet. It has a perfect 100 rating on both beeradvocate.com and ratebeer.com. It has been voted as the #1 beer by several beer and consumer polls. This Belgian Abbey is brewed by monks (literally) and has been making the world's highest rated beer since 1940. Westvleteren XII has never reached American soil (legally) until now. Less than 8000 six packs, or gift packs (each six pack will include two souvenir glasses), have been distributed to the US and many of these gift packs will be sold at the chain, Total Wine and More for a whopping $85--many believe this is actually a good deal. As the news spread, many people jumped with joy in anticipating. I imagine beernerds around the country were shouting, "The Westies are coming! The Westies are coming!" No longer do little boys and girls need to hope for a beer trade with Santa. On December 12, anyone who stands in line at their local TWM at least has a shot at purchasing their own six pack of the Holy (again, literally) juice. At least that's what everyone was told. After announcing TWM would be selling the beer in 9 states on 12.12.12, some stores actually sold some of the gift packs early. Beerstreetjournal.com reported that several Total Wine stores sold the gift packs on December 1st--nearly two weeks early! This has upset many and left others wondering whether the stores will even have any to sell on the 12th. Like I have seen so many times, this looks like a classic case of store employees taking cases home for themselves and selling the rest to their friends. It's another example of a highly anticipated beer release going out to the people on the inside, leaving the average folk like you and me left with our hearts broken and mouths watering.